bcarso gave me a tip from Horowitz and Hill "Art of Electronics" 3rd Edition on the low rbb Diodes Inc./Zetex ZTX851 (NPN) and ZTX951 (PNP) transistors. The TO-92 Zetex ZTX851/951 are designed for "emergency lighting" and are not characterized for small-signal or noise performance. The rbb at 10 mA on the ZTX851 however is reported to be below 2 Ohms. The noise performance of the Zetex ZTX851 turns out to be very, very good. 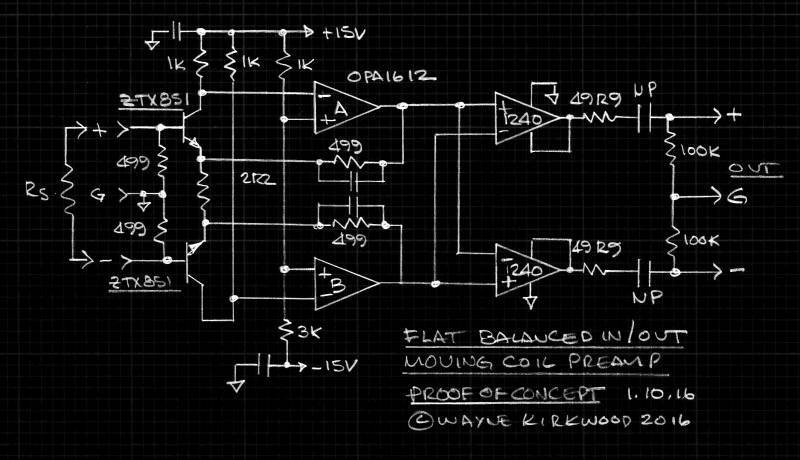 This is the test circuit I used to see how well it would be as a moving coil preamp. No effort has been made to address the DC performance - output offset is allowed to develop. A Balanced Input Balanced Output Flat Preamp for Moving Coil Cartridges or Mic Preamps Using the ZTX851. Proof of Concept Schematic. The circuit is based on Demrow et al with Cohen low noise optimization. A 1R Rsource comes in around -142 dBu ein. The ZTX851 also does quite well at lower Ic. The gain measured just under 53 dB owing to protoboard contact resistance to the 2R2 Rgain resistor so the noise may be a tad higher. I need to melt solder to know for sure. I haven't measured the bias current but Ios - cartridge current - comes in at 80 nA. An ein of -140dBu works out to be 18 Ohms. Subtracting 10R for the source and 2R2 for Rgain leaves an rbb of about 2.9 Ohms per transistor. An NJM2068 provides almost identical noise performance to the far more expensive OPA1612 at the expense of bandwidth. An NJM2114 is easily 3 dB noisier in this circuit. The low Rbb is a side effect of designing the transistors for high current. The Hfe looks lower than the obsolete purpose engineered low Rbb devices the Japanese made for MC head amps back in the '70s. IIRC those old parts had betas as high as 600 or more. There is some relationship between beta and input current noise, but with low single digit source impedance, current noise is not a huge deal, and then there is some cancellation of that noise from using a balanced input and relatively large termination impedance (499 is large wrt to cart Z). Glad to hear Brad is OK, I think he may have blocked me on facebook because of me being me. (Maybe I need to check my snarky comments about phono preamps here too ). PS: Its and old trick to use high current transistors for unintended low noise. The transistors Paul Buff used in his transamps and VCAs were general purpose medium power devices. I think he had to screen them for process noise, but back in the day we didn't have the low noise devices we do now. I tested a lot of ZTX medium power transistors circa 1980 when I was playing with MC cartridges & preamps, and so did Peter Baxandall. They did have small Rbb' but you had to select for 1/f noise. Once I found the Hitachi 2sa108x & 2sc254x devices, I stopped looking as they were better and didn't need selection. Can't remember if ZTX851 was among them. I'm not seeing significant 1/f noise on the 'scope or FFTs but I haven't applied RIAA EQ to the output which does magnify the LF. What I am seeing is the need to thermally couple the devices as I can simulate 1/f effects by simply blowing on them or creating air currents by waving my hand over the pair. The temperature gradient does make the Vos bobble around and appears like VLF 1/f but its not. If I put a blanket over them it goes away. The ZTX851 aren't exactly a TO-92 so finding a clip may not be easy. I'm thinking about wrapping them in a strip of foil and then applying heatshrink or maybe JB-Welding them together inside a metal nut or tube. Horowitz and Hill did a 70 pV/sqrtHz transformerless ribbon mic front-end with paralleled ZTX-851s. In the post I saw Hill didn't mention anything about selection. The Third Edition is on my Amazon wish list. John - You're right about adding a cap across the top leg of the bias voltage divider. I left it bare to see how good a PSRR it might have. Turned out to be pretty good. H&H published some interesting noise comparisons of the ZTX851. The 2sd786 is the npn version of the 2sb737 pnp I used in my phono preamp. As I recall the pnp 737 was "slightly" lower noise than the 786, which is why I used it when given a choice. Peavey already had the 2sd786 in their system when I was hired so I just used that in my mic preamps instead of bringing in yet another part number for a fraction of a dB NF improvement. The 786 looks pretty respectable in that comparison, especially considering that it's from the '70s and obsolete now. BTW I still haven't found my private stash of 737s... I must have put them somewhere very safe, hidden from myself. ricardo wrote: They did have small Rbb' but you had to select for 1/f noise. But my small experience suggested that in 1980, they were correlated for these devices. AoE 3rd Ed. The Eagle has landed! Dis beach bum might have to get a proper job so he can buy books. Especially as 35+ yrs on, they seem to have cracked popcorn & 1/f noise. John, there was a time in the late 70's when Philips NE5534AN, the guaranteed LN version was in short supply. We set up a test rig to select common or garden 5534s for critical applications. We found ALL the Philips cheapo 5534s easily met the higher 5534AN LN spec. I must have tested at least 100 myself. 10 yrs later, I sallied once again into electronics but found this situation no longer held. 5532/4s were no longer hand carved by Virgins in the Philips Southampton, UK factory and if anything, they were all slightly noisier. But the good news is that new stuff like NJM2068 now enable similar or better LN. I did listen to the noise floor of the ZTX851 moving coil preamp specifically for popcorn noise and it was smooth as silk. H&H also found good device consistency for the ZTX851 and ZTX951. I have a few samples of the 2SB737 that Al Burdick gave me from the Benchmark Media days in his Garland garage. I should turn the test circuit upside down for PNPs and compare the 2SB737 to the ZTX951. H&H also gave the ZTX951 PNP a slight edge for lower rbb. I have a few days worth of work on the bench to do but when I finish I'll fire the test circuit back up and post some FFTs of the ZTX851, ZTX951 and 2SB737 noise. What was really cool was that the ZTX851 front-end was equally quiet with the OPA1612 as it was with the NJM2068. The NJM2114 was a couple of dB higher due to its higher voltage noise. The NJM2068DD datasheet can't be directly compared to the NJM2114 or most any other op amp because it's datasheet noise specification has RIAA weighting. But the 2068 has got to be in the <<3nV/sqrtHz category to compare better than the 2114 and as good as the OPA1612. I don't think I'd use the NJM2068s due to their lower bandwidth in this circuit but they provide a very low cost option. The OPA1612s on a DIP adapter are about $14. In addition to the bypass electolytic John suggested I wonder if I should add some base-emitter capacitors or differential capacitive termination. I never saw any tendency for it to oscillate but the impedances are so low and the opportunity for a base stopper resistor non-existant due to its noise contribution there ought to be something to prevent VHF oscillation. A couple of B-E caps from 100-680 pF might help. They wouldn't affect CMRR because they're bootstrapped. The real test is to feed it with a MC cart at the end of cable. Though there's not a lot of inductance compared to a MM there's some. While I don't expect input noise current to be much of a problem in a MC preamp it might reveal a larger difference between the purpose engineered low noise devices (with higher beta) and re-purposed low Rbb devices. A revealing test might be to look for the total noise difference between input shorted and input terminated with fixed resistance (or a cart). Those devices might be nice for a ribbon mic preamp too. JR. wrote: While I don't expect input noise current to be much of a problem in a MC preamp it might reveal a larger difference between the purpose engineered low noise devices (with higher beta) and re-purposed low Rbb devices. A revealing test might be to look for the total noise difference between input shorted and input terminated with fixed resistance (or a cart). the 1/f 'knee' and popcorn noise is more evident/serious in Eni compared to Env on the datasheets of most LN devices.